Japan has confirmed the deaths of two more of its citizens in last week's hostage siege in Algeria, raising the number of Japanese victims to nine. One Japanese national is still missing. Japan is the foreign country to have suffered the heaviest confirmed loss of life during the Islamist militant attack on a Saharan gas plant. So far 69 people, including 39 foreigners, are thought to have died. Algerian militant Mokhtar Belmokhtar claimed responsibility for the raid. Heavily armed gunmen stormed the Tigantourine gas factory, which housed hundreds of foreign and Algerian workers, on 16 January. Some 685 Algerians and 100 foreigners escaped or were freed during the four-day siege, which ended after Algerian special forces stormed the compound. On Wednesday, Algeria's defence ministry announced for the first time that it did not sustain heavy losses in the military operation. Eight of its soldiers suffered only minor wounds, the ministry said in a statement. Among those held captive by the militants were employees of Japanese company JGC Corp, which provided engineering services at the site. Earlier this week, Japan said seven of its citizens were killed during the attack, while three more were still missing. At a press conference on Wednesday, Chief Cabinet Secretary Yoshihide Suga confirmed two more bodies had now been identified. "Unfortunately, we have been able to confirm two more deaths," he said. "It truly saddens us to learn that precious human lives were taken away. The use of violence cannot be tolerated for any reason. We firmly condemn acts of terror." He added that Japan would do everything in its power to determine the fate of the last missing citizen. The Japanese government has been highly critical of Algeria's decision to launch an attack on the militants without consulting other countries whose citizens were also being held hostage. The Algerian ambassador in Tokyo was summoned over the incident as the hostage crisis was unfolding. "Japan is strongly concerned about acts that put the lives of the hostages at risk, and it is regrettable that the Algerian government pressed military rescue operations," the foreign ministry said in a statement last Friday. Japan has asked Algeria to investigate events at the gas plant and the circumstances under which people had died. "Algeria has promised to co-operate as much as possible," Mr Suga said. Meanwhile, Japanese officials have flown to Algeria to repatriate the victims as well as a number of hostages who survived the attack. 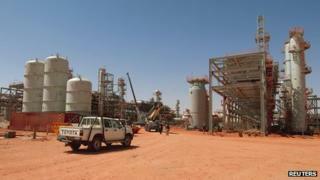 The In Amenas gas plant is a joint venture between Algeria and foreign companies. Among the dead or missing are workers from Norway, the Philippines, Malaysia and Romania. Of the 32 attackers, 29 were killed and three captured alive, the Algerian government said. The kidnappers claimed their attack was in retaliation for France's intervention in the war against Islamist militants in Mali. Algeria has rejected this, saying the raid had been planned for more than two months. The gunmen, thought to have travelled from northern Mali, came from several countries, including Canada, Mauritania, Egypt, Tunisia, Mali, Niger and Algeria itself, officials said. Their leader, Mokhtar Belmokhtar, is a former al-Qaeda commander who split from the movement and created his own Islamist group.